B. Borrman says: The Jaguar XK — one of the world's greatest examples of the straight six. A 44 year regular production run. Five Le Mans victories. ('51 and '53 for the C-Type, '55, '56 and '57 for the D-Type). Debuted in the XK120, and went onto power over a half dozen other true icons — the XK140, XK150, C-Type, D-Type, E-Type and the XJ6 Series I-III (not to mention the Mark I, II, VII, VIII, IX, X, 420, 340 and S-Type saloons). Production began in 1948 with the XK120 and didn't finish until the last Daimler limo rolled off the line in 1992. The Queens' Daimler stills charges ahead under the XK's venerable power. Perfect? No. Absolutely not. I own a '77 versions when things got hairy — as they did in every aspect of the British auto industry. But even with lax standards, the XK from the years of the Prince of Darkness remains remarkably reliable if well maintained. 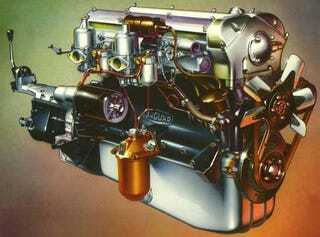 And the versions from the '50s and '60s are some of the most dependable engines of the era. Please. Pretty Please. If nothing else, just put in for how amazing this thing sounds when running at a full roar.